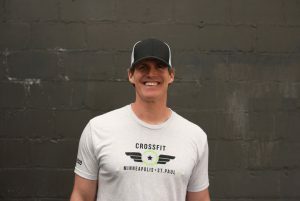 I stumbled upon CrossFit one night while reading through an online training forum. It sounded really interesting so over the next few hours l looked into it more and was really impressed with what l learned. I decided right then l had to give it a try, so l threw on some workout clothes and headed to a nearby park that had a jungle gym I could use for pull-ups. For my very first CrossFit workout I decided to go with something known as half “Cindy” where a person completes as many rounds as possible in 10 minutes of: 5 pull-ups, 10 push-ups and 15 air squats. I remember hitting it as hard as I could and I remember lil “Cindy” hitting me hard right back! I looked at the clock at one point thinking l had to be close to the finish, but of course l wasn’t even halfway done. When it finally was over l laid down in the dewy grass and stared up into the night sky for at least another 10 minutes as l caught my breath and let my heart rate drop back down to normal. It was intense. I loved it. I CrossFit because… I want to live a long and healthy life. I coach because… I enjoy helping people and I love watching them achieve things they may not have thought possible.